Source: U.S. Environmental Protection Agency, Clean Air Markets Division. Emissionsof sulfur dioxide (SO2) and nitrogen oxides (NOx) from the electric power sector in 2012 declined to their lowest level since the passage of the Clean Air Act Amendments of 1990. The decline in emissions is due primarily to an increasing number of coal-fired units retrofitted with flue-gas desulfurization (FGD), or scrubbers, to coal plants switching to lower sulfur coal, and to selective catalytic reduction (SCRs), selective noncatalytic reduction (SNCR), or low NOx burners to limit NOx emissions. In recent years the decreased use of coal for electric power generation because of cheaper natural gas has also played a significant role in the SO2 and NOx emissions declines. 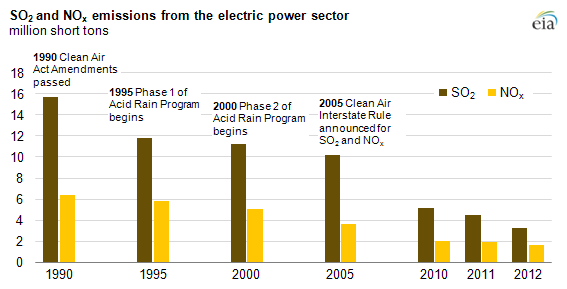 The decline in SO2 and NOx emissions began soon after enactment of the 1990 Clean Air Act Amendments, which established a national cap-and-trade program for SO2 and required other controls for NOx emissions from fossil-fueled electric power plants. The program was primarily motivated by concerns regarding acid rain affecting areas downwind of plants emitting these compounds. Because coal-fired units accounted for a large share of SO2 and NOx emissions, the program provided an economic incentive for coal-fired power plants to reduce emissions by installing pollution control systems, burning lower sulfur coal, or, for high-emitting plants, dispatching less electricity. In 2005, EPA developed the Clean Air Interstate Rule, a cap-and-trade program intended to reduce SO2 and NOx emissions beyond the levels defined by the acid rain program in the eastern half of the United States. While that rule and several proposed alternatives have been challenged in the courts, 91 GW of coal-fired power capacity was retrofitted with FGD scrubbers between 2005 and 2011. By the end of 2011, 60% of the U.S. coal fleet had FGD scrubbers installed, and 67% had either a SCR or a SNCR installed. Additional state requirements and settlements under the Clean Air Act's New Source Review program also contributed to the increases in coal plant environmental retrofits. The Mercury and Air Toxics Standards, issued in 2011 and set to take effect in 2015, do not directly regulate SO2 or NOx but the standards should lead coal-fired power plants to install equipment that further limits SO2 emissions.